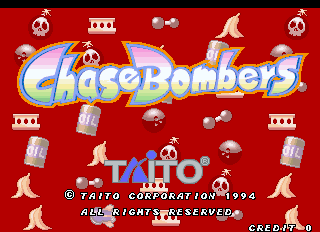 Chase Bombers © 1994 Taito. A chase-view crazy racing game. WELCOME TO THE CUSTOMIZED CAR CARNIVAL! Choose your Vehicle and one of the challenging race courses. Rev your engine and get ready to roll. Be carefull there are mines and steel poles as obstacles to slow you down. Rival racers attack and obstruct you must avoid the traps and to use your advantage and pick on the Item Gate to use your specialized arsenal to crash the enemy drivers and race for the checkered flag! 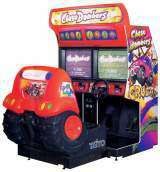 There are five customized vehicles to choose from, including a Formula-One machine and a custom truck. Chase Bombers was eeleased in September 1994 in Japan. The drivers in the police car looks like to Tony Gibson and Nancy from Chase HQ series, in the sequal "Super Chase - Criminal Termination"